A brass honour roll commemorates those from the district who served in World War One. The roll was originally unveiled in 1917. The little settlement of Humpybong has given 56 of its young men to serve in the cause of Empire. Of that number six have made the supreme sacrifice, and if conscription came into force today it is improbable that more than three or four eligible young men could be found to come within the scope of the proposed scheme. These remarkable facts were brought out at a function held at the Humpybong State School yesterday, when a handsome honor board was unveiled by Mr. James Forsyth, M.L.A. The local Progress Association arranged the ceremony, the president (Mr. Ashmole) and the secretary (Mr. Rawlinson), in addition to Mr. Forsyth, offering their tributes to the heroes who had enlisted. The honor roll, which cost between £35 and £40, was subscribed wholly by the residents of the district. 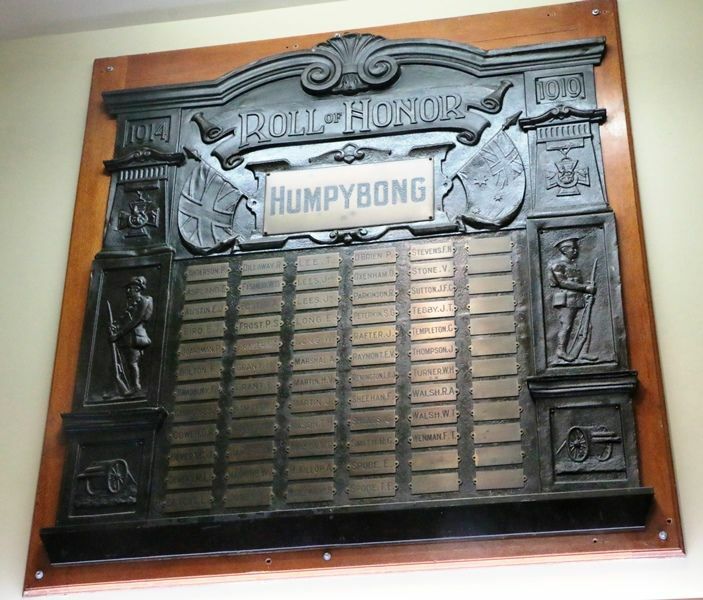 It is a handsome embossed bronze tablet, mounted upon marble, and the names of all the young men who have enlisted from Humpybong are inscribed upon it. The local school children assembled in full force at the school, and there was a large attendance of the parents. The children, under the leadership of the schoolmaster (Mr. Stapleton) rendered a number of patriotic songs. Daily Mail (Brisbane), 24 November 1917.